My Mother’s Day started a little early. On Friday my son’s Kindergarten class presented their alphabet show. They have been practicing for this show all year. The two Kindergarten classes joined forces and for each letter did a song, dance or one student recited a poem. The show was fantastic. I was so impressed by how well they knew each performance. The kids didn’t seem nervous at all. The dances involved basic ballroom dancing choreography. I love that the children are encouraged and taught to dance with partners. My son read the poem for letter N and did a great job. 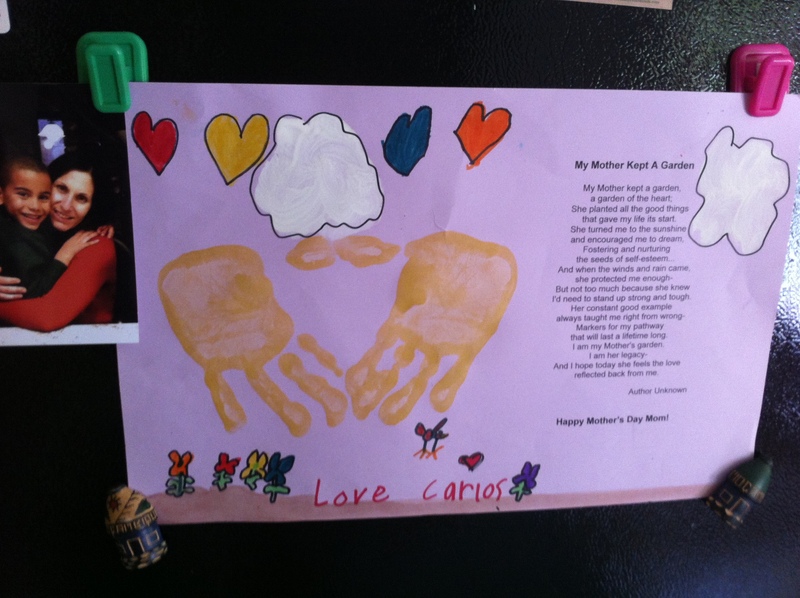 After the show we went to the classroom where I was presented with a homemade Mother’s Day poster complete with Carlos’ handprints. My those hands are getting big! Carlos was so excited to give this to me. I love it! Handmade cards are truly the best. 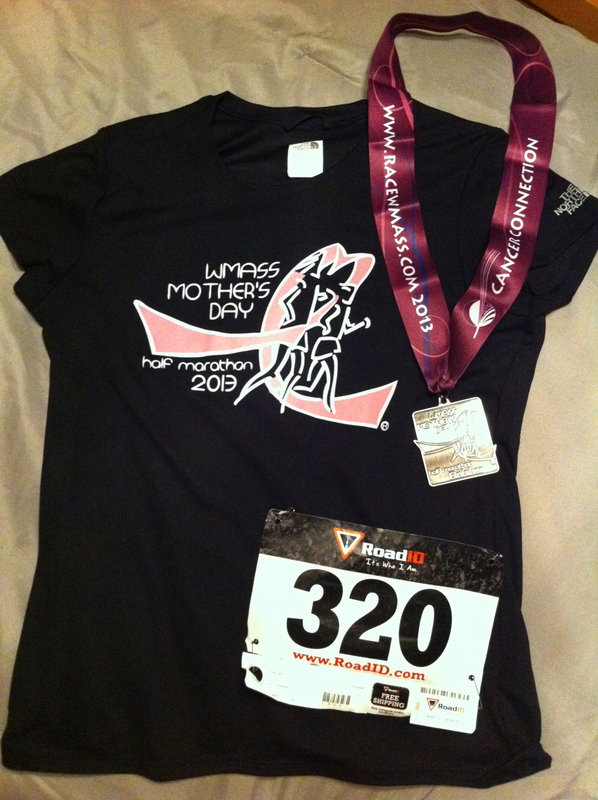 The plan for Mother’s Day was for me to leave work a little early at 6 a.m. and head up to Whately, MA to pick up my WMass Mother’s Day Half Marathon packet. Since it’s only about 25 minutes away I thought it would be best to let Carlos and Orlando meet me at the finish line rather than wait around while I run for 2+ hours. Running this race was a spur of the moment decision. I have wanted to run it since it started 3 years ago, but I always have to work the night before. Last week I decided what the hell I’m going to run it for me. I’ll treat it like a long run and just go for the fun of it. Best decision ever! The weather turned out perfect despite the rain the day before. I cannot say enough good things about this race. It was extremely well organized. The volunteers were delightful. The course offered beautiful scenery and a faithful group of spectators along the way. All proceeds benefit the Cancer Connection in Northampton, MA so the money stayed local. This is a nonprofit organization that is dedicated to providing services for those living with cancer as well as their families and caregivers through workshops, seminars, counseling and complimentary therapies. For a small race I was quite impressed with the quality of the medals and the shirts we received. That’s a North Face tech tee. I loved this race. I felt great despite working all night. 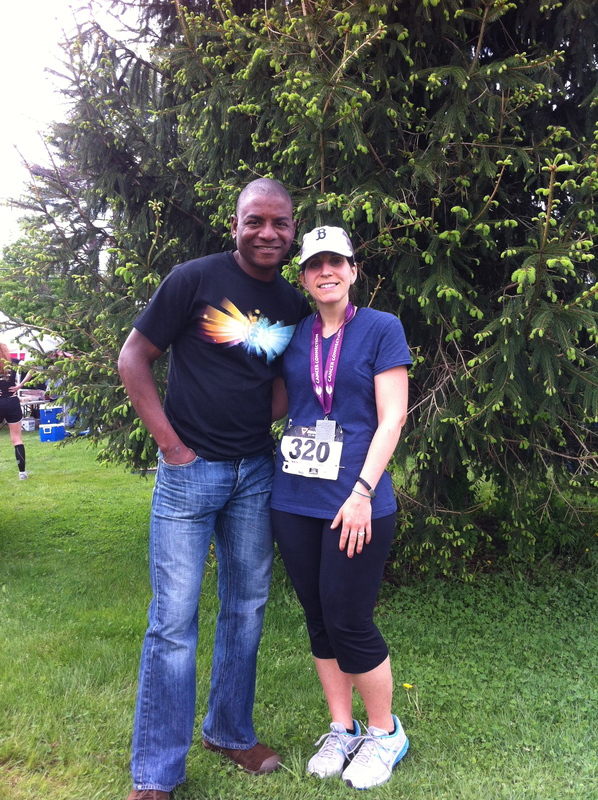 I ran my best, but also enjoyed the views of the mountains, farms and beautifully landscaped yards. The miles literally flew by. I thought a lot about holidays in years past. They were solely an excuse to eat. I’ve changed that aspect of holidays for myself. I try to do something a little extra on those special days to honor the healthy changes I’ve made over the last few years. This race was my gift to myself this Mother’s Day. I was not running for a PR nor did I set one (see my race page for my time). I ran a great race, but the prize at the end was not the medal or the time. It was the same thing as it always is, the inspiration to continue this journey. And if I start to waiver and doubt myself I am so lucky to have one constant source of support. He didn’t sign up for this, but he hasn’t looked back once and I know that the changes I’ve made to get healthy have also benefitted him. We celebrated the rest of Mother’s Day with my mom. It was low key and quiet as she was recovering from a strain in her neck. Next weekend my sister will be home for the weekend and we will have another mini celebration. In case you can’t read it from the picture here is the poem on the poster my son made for me. I was offline all weekend and just catching up. Hooray for doing that race for yourself! Brave woman too for doing it after working all night too. And of course, I always love the customary hug picture with Carlos and you wearing your medal. Had fun family time and a great dinner made by my hubs last night – I am blessed! 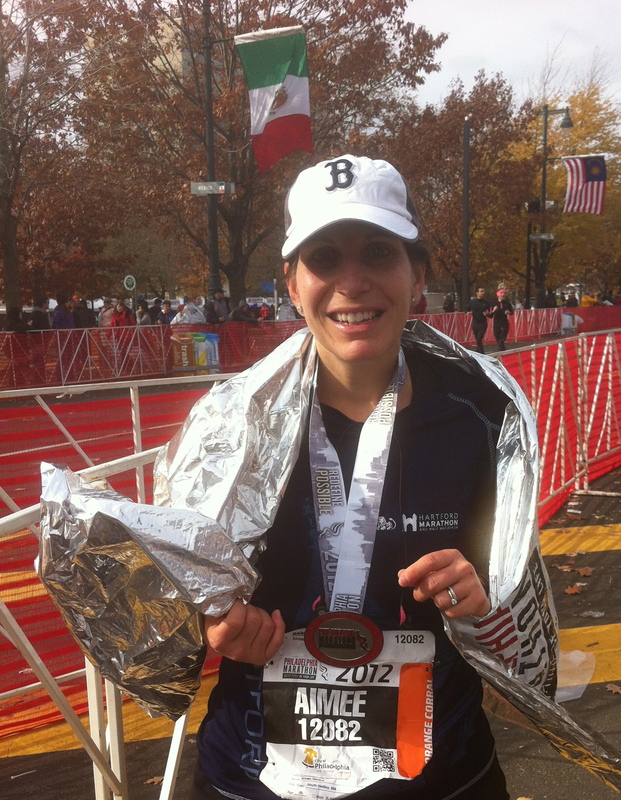 I’m glad you had a great Mother’s Day Aimee…looks like a beautiful run, ending with the best thing…your family…Carlos is so cute! What an awesome way to celebrate Mother’s Day. 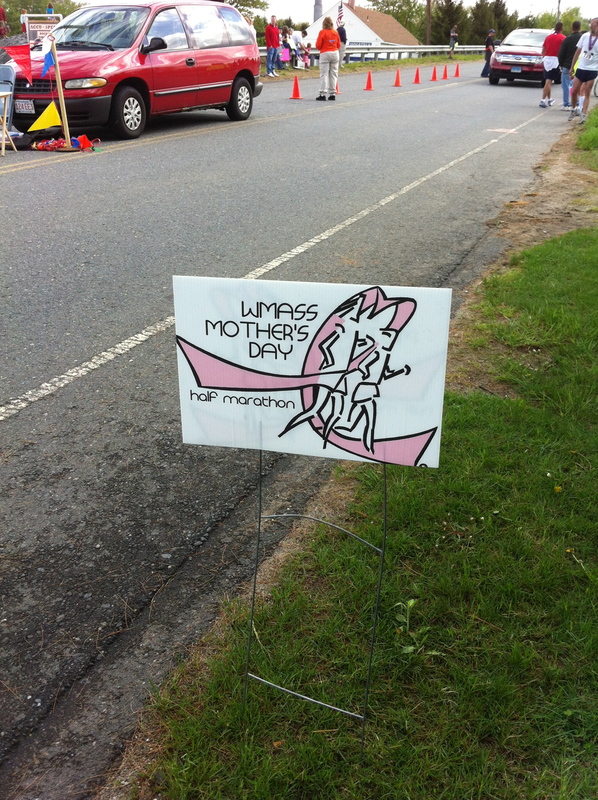 The half I did on Sunday gave out flowers to women at the end in honor of Mother’s Day, and I was surprised by the number of families at the finish line, particularly for such a small race — I could tell many women decided that was how they chose to celebrate the day! Love the family pics at the end, you’re blessed indeed! I’m glad that you had a great Mothers Day. I love the girl Carlos made you, so adorable 🙂 Great job on the race as well, you look amazing, girl! What a great Mother’s Day! 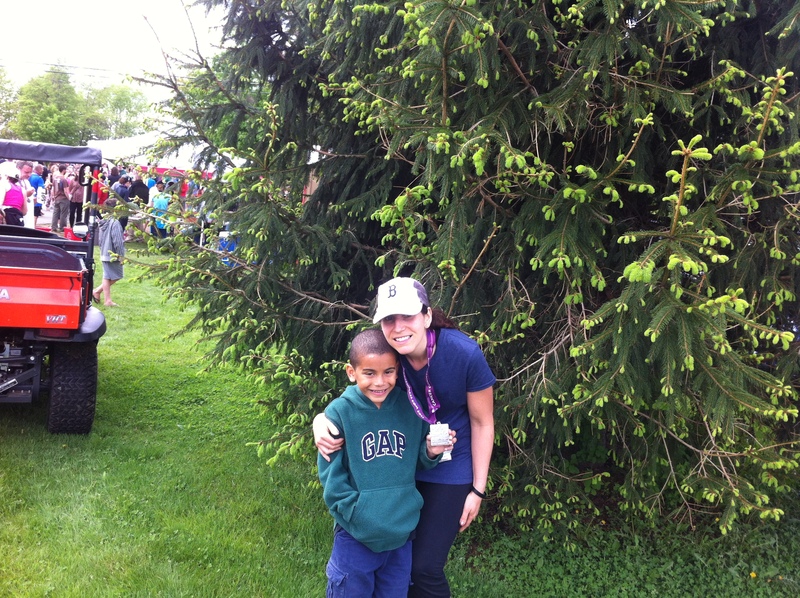 Great job running the race, and love the card – love the hand prints.